I've got a hella 70's wrap sweater I bought at Wasteland last spring (ONE HUNDRED PERCENT ACRYLIC!) that I can't seem to work up the nerve to wear out of the house. Doesn't prevent me from admiring the terrif selection of wrap sweaters from Salvage Life Vintage. 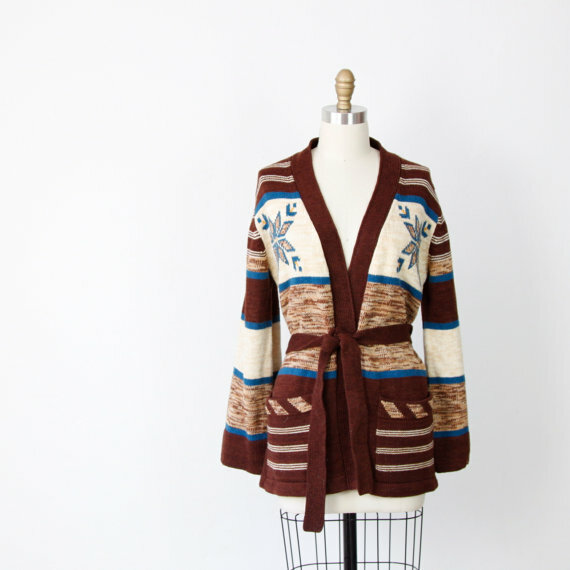 In related news, I saw more than one Vancouver girl rocking the hell out of a Lebowski sweater. For the record, the "Lebowski sweaters" you are seeing are Cowichan sweaters, traditionally made by the Cowichan First Nations people and now thoroughly co-opted by hipsters (and the 2010 olympics and roots). 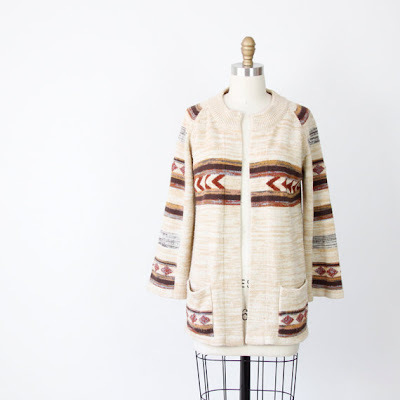 If you choose to rock a Cowichan, consider buying one knit by a Cowichan person and not manufactured in China. OMG reading that comment made me want to slit my wrists. I kind of dig the first one ... not sure I have the ballz to pull it off. Damn. This shiz got dramatic fast. When I first read this, I thought you meant wrap sweaters like BALLET wrap sweaters (of which I have about 25). But I also like these and own a Lebowski sweater, so I'm pro sweater all around. I like that sweater in The Killing. And I don't even like The Killing.